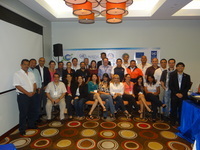 The Workshop on Disaster Recovery Planning held at Radisson Summit Hotel in Panama City on 24-26 September 2012 was one of the 15 workshops covered under the European Commission (EC) funded project titled "Strengthening Region-based Capacities in Pre-Disaster Recovery Planning". This project is being implemented by the United Nations International Strategy for Disaster Reduction (UNISDR) through the International Recovery Platform and Asian Disaster Reduction Center (IRP/ADRC) in close coordination with the Central America Integration System for Regional Disaster Risk Management (SICA), Coordinating Center for the Prevention of Natural Disasters in Central America (CEPREDENAC), and the Government of Panama. Over 32 officials from national government, local governments, development organizations, and civil society organizations of Costa Rica, Guatemala, Honduras, Nicaragua, and Panama participated in the workshop. The composition of participants was ideal in making sure that the planning process encapsulates local knowledge, regional experience, and international sectoral expertise. The workshop resulted in discussions among representatives from government bodies, national platforms (including members of civil society organizations), and IRP/ADRC partners to further share knowledge and exchange information for recovery planning to close knowledge gaps on recovery. One of the agreed actions was for UNISDR for the Americas to seek the services of a consultant to further enrich the workshop module - adapting more local cases and translation of materials from English to Spanish - to scale up the workshop in countries of the region. Participants coming from universities agreed to discuss measures to promote academic courses relative to recovery planning. Government representatives also expressed interest in integrating recovery concerns in development planning and how to bring this interest down to the local levels as well as to other sector of the government that are engaged in recovery planning. For continued partnerships, UNISDR for the Americas and IRP are discussing with CEPREDENAC options to facilitate effective modalities for strengthening the capacities of Central American states in recovery planning. Overall, the workshop enriched participants' knowledge of integrating disaster recovery planning into their national DRR plans, UNDAFs, and other planning/programming instruments.